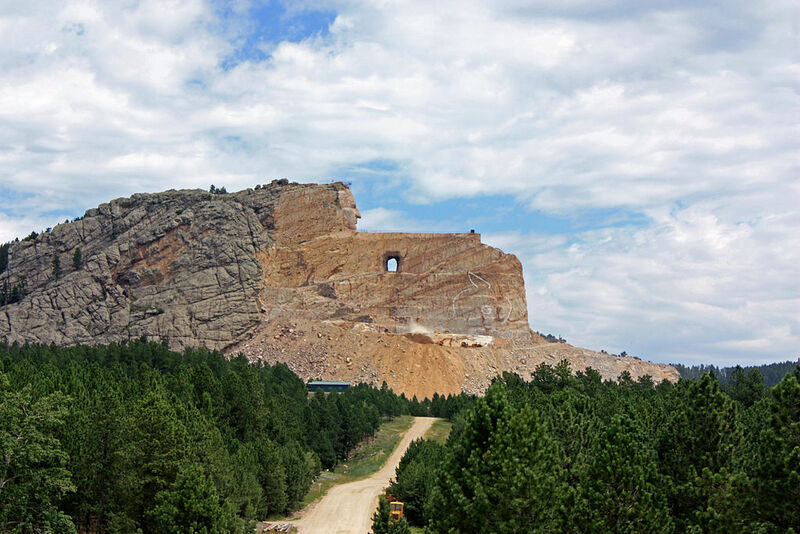 Photo Credit To Wikipedia Commons/ "Crazy Horse Memorial 2010" by Tbennert - Own work. Licensed under CC BY-SA 3.0 via Commons. The monument is planned to be 172 meters tall upon completion. Polish-American sculptor Korczak Ziolkowski started building it back in 1948, and didn't even get close to finishing it. His work has been continued by his wife and children. The author of what will one day be the largest sculpture in the world was born on this day in 1908. His name was Korczak Ziolkowski and he was of Polish-American origin. He designed a monumental sculpture of the renowned Native American chief Crazy Horse, which he began building in the Black Hills, South Dakota. Once the monument is completed, it will be the largest monument in the world by far, some 172 meters tall and 195 meters wide. The building of the monument was first proposed by Native American chief Henry Standing Bear back in 1929. He appealed to Korczak Ziolkowski, a professional sculptor. Ziolkowski was an appropriate man for the job because he already possessed experience in producing monumental sculptures (the famous Mount Rushmore sculpture was his work). The Crazy Horse Monument was supposed to be much larger than the Mount Rushmore sculptures. In fact, the monument is so large that all four presidents from mount Rushmore could fit on its face. Ziolkowski first made models of the sculpture, and then began working on the monument itself in 1948, starting by blasting the mountainside. Ziolkowski first suggested that the sculpture should be made in Wyoming, but the Lakota people (of whom the aforementioned Henry Standing Bear and Crazy Horse were members) wanted the monument to be situated in the Black Hills, which they consider a holy place. The selected location was Thunderhead Mountain, only around 20 kilometers from Mount Rushmore. Ziolkowski later went to live near the monument site, where he worked together with his wife and children. He died in 1982, leaving the monument nowhere near completion. His work has been continued by his wife and children (one of his daughters is reputedly a sculptor). The face of the sculpture was finished as late as 1998. A museum and cultural center were erected nearby.